There’s no shortage of weather apps out there – Yahoo recently rolled out an all-new weather app for iOS, tapping Flickr to bring users’ weather-themed photos into the mix. And YoWindow recently arrived for iPhones too. 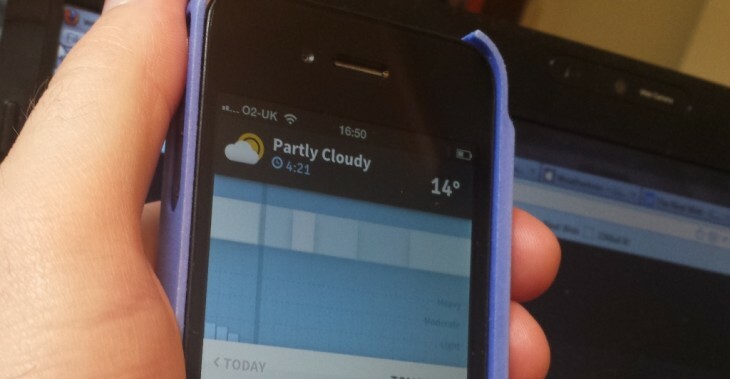 But Weathertron for iOS might just be worth your time (and money). Launched in the App Store yesterday, Weathertron displays a live, visual minute-by-minute forecast, and lets you scroll forward in small increments to see how the weather’s looking 2 minutes from now or 2 hours from now. It displays sky condition, temperature, and associated ‘warnings’. It’s a really well constructed app with a strong focus on design. You can search for forecasts by your current location, or by city. Indeed, it displays 24-hour weather visualizations for today and tomorrow, a 7-day forecast for the week ahead and lets you choose between Fahrenheit and Celsius, as well as 12- or 24-hour clock. If you’re into mobile weather forecasts, you likely have your weapon of choice already. But if you’re in the market for something new, this app should certainly be on your radar. Optimized for iPhone, iPad and iPod touch, Weathertron taps the API from Forecast.io, the same service that powers Dark Sky for iOS. It’s available to download for $0.99 or your local currency equivalent now.